For some reason, I am a blue-colored girl through and through! I love a good royal blue, baby blue, teal, turquoise (of course), but my new-found love is definitely a minty blue. Some might argue that “mint” is considered a green. Well, I agree to an extent. The best thing about mint is that it comes in all different shades. I have a pair of mint shorts that seem to have more of a hint of green than blue. I’ll be sure to post them soon! 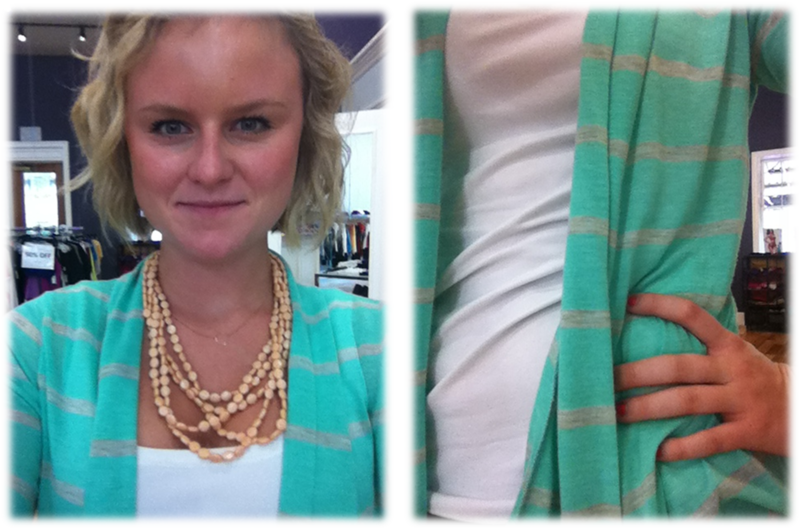 Well, I found this new mint/gray striped cardigan the other day and it couldn’t be more perfect! I’ve already worn it a couple of times and the compliments are endless. My favorite part about cardis is that you can wear them with any outfit and they seem to pull it all together, especially when they are a bold color. I thought the peach necklace complements the cardigan as well. What do you think? ?